Brown-Eyed Susans (Rudbeckia triloba, a member of the sunflower family) are blooming in profusion these days. 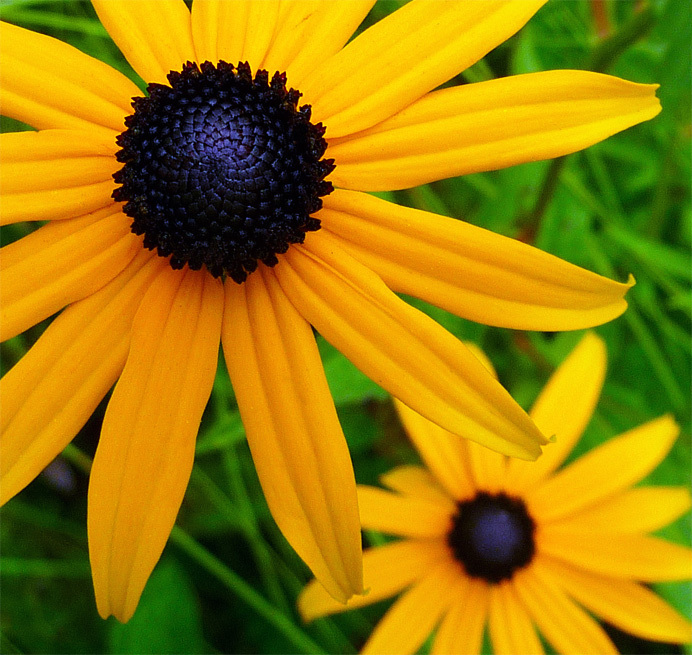 They're also known as Black-Eyed Susan, Brown Betty, Golden Jerusalem, and Yellow Ox-Eye Daisy. I photographed these in a Kilian Drive flower garden that reverted to weeds when the owner moved away. I've always had a soft spot for this flower. In one of my earliest memories, I toddle into the meadow beside my boyhood home and stand in a thicket of Susans, marveling at their blazing color and feeling their scratchy stems against my legs. Many years later, I jumped over an electric cattle fence near Clearfield, Pennsylvania, and picked an armload of Susans to cheer up my girlfriend, who was sick that day. We've been married 37 years. .